Nicola Pietropoli is a doctoral student at the University of Bologna studying democratic innovation, specifically Law 69/2007 of the Tuscany Region and some twenty processes promoted by this reform that he first learned about through his involvement with Participedia. 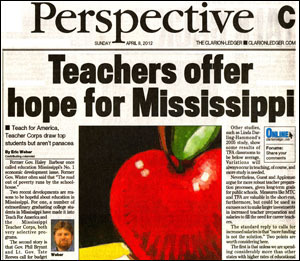 My op-ed titled "Teachers Offer Hope for Mississippi," in The Clarion Ledger, April 8, 2012, 1C-2C. As always, visit my Web site at: http://www.EricThomasWeber.org and follow me on Twitter.com/erictweber. I've got a scanned version of my piece here, and the text of it below in this blog post. The following is the text for my piece, "Teachers Offer Hope for Mississippi," which came out in The Clarion Ledger, of Jackson, MS, on April 8th, 2012, pages 1C-2C. I repost my articles here, since the pieces get archived after a week and I've been given permission to post them here to keep them available to the public. Former Gov. Haley Barbour once called education Mississippi's No. 1 economic development issue. Former Gov. Winter often said that "The road out of poverty runs by the schoolhouse." Two recent developments are reasons to be hopeful about education in Mississippi. For one, a number of extraordinary graduating college students in Mississippi have made it into Teach For America and the Mississippi Teacher Corps, both very selective programs. The second story is that Gov. Phil Bryant and Lt. Gov. Tate Reeves call for budget increases for TFA and MTC, requesting increases of $12 million and $1 million, respectively. The programs address the need for more teachers in the state, thus increased support would make a difference. These developments are good news, even if criticisms are raised when leaders depend too much on such programs. To appreciate both points of view, we can say that TFA and the MTC do great work, but they do represent temporary solutions to our long-term educational challenges. Overall, the best news is that many of our brightest students are looking to serve the state and the country in this vital area. TFA and MTC are special programs that bring some of the brightest new college graduates to teach in impoverished areas. Both programs are attracting truly remarkable talent. In 2011, TFA received 48,000 applications from around the country, according to Regional Communications Director Kaitlin Gastrock. Only 14 percent of applicants were accepted. MTC, a state program, received 380 applications last year and accepted only 10 percent of those. As a reference, TFA's acceptance rate is more selective than what you find in undergraduate admissions to Vanderbilt, Duke, and the University of Chicago. TFA and MTC are drawing a great deal of interest and are selecting from very strong applicants. This year, a number of University of Mississippi students were accepted into these competitive programs. Both categories include a number of Honors College students and one is a Phi Beta Kappa honoree. These are some of the strongest students at the University of Mississippi. MTC Program Manager Ben Guest has argued that teacher quality and availability are two of the most important areas of need for Mississippi's schools. He thinks that the state should significantly increase teacher salaries to draw strong career teachers. At the same time, he advocates for MTC and TFA as temporary measures, until the public will is garnered to undertake bigger, needed investment. Guest and others think that TFA throws underprepared teachers into some of the most challenging classrooms in the country. Professor Deborah Appleman of Carleton College argued in 2009 that teaching takes a great deal of preparation, and TFA provides only a very brief introduction to the practice. On the issue of preparation, studies are inconclusive. Some, such as the 2004 Mathematica Policy Research study, are favorable about the outcomes from TFA taught students. Other studies, such as Linda Darling-Hammond's 2005 study, show some results of TFA classrooms to be below average. Variations will always occur in teaching, of course, and more study is needed. Nevertheless, Guest and Appleman argue for more robust teacher preparation processes, given long-term goals for public schools. Measures like MTC and TFA are valuable in the short-run, furthermore, but could be used as excuses not to make larger investments in increased teacher preparation and salaries to fill the need for career teachers. The standard reply to calls for increased salaries is that "more funding is not the solution." Two points are worth considering here. The first is that unless we are spending considerably more than other states with higher rates of educational attainment, the assumption is untested. According to a 2009 U.S. Census Bureau report, Mississippi spent $8,919 per pupil per year. By contrast, Pennsylvania, Maine, and Alaska each spent more than $15,000 per pupil, while yielding stronger graduation rates than Mississippi's, according to the New America Foundation. The second point is that troubled and failing schools can require more money per pupil than successful schools, and beyond any present differences in funding. Bigger challenges normally come with higher price tags. Modest increases in funding may not make much difference, as the key challenge suggests, but substantial investments very well could. My favorite analogy is that hopping a curb in a car may not work with only small nudges on the gas. More substantial efforts, however, more gas, might get the desired result. Guest recognizes that big changes are difficult to achieve, of course. He and others do what they can to address deep problems in our schools with programs like TFA and MTC, but not without recognition of the programs' limited goals and reach. There is more value to both the teachers in TFA and MTC and their students than people commonly recognize. First, there are few settings as rich for professional development as classrooms. The classroom is one of the most extensive systems where the rubber meets the road every day in terms of public policy's connection to real-life challenges. Plus, in the mechanics of the classroom, teachers learn about people and communities that they were unfamiliar with before. They gain public speaking skills, facilitation skills, as well as political acumen, as they navigate personalities and hierarchies within the schools. A further benefit gained from TFA and MTC teachers goes beyond class material, in exposing kids to talented and caring young college graduates. Cultural obstacles often impede progress in addressing both poverty and educational attainment. For, if students are unable to imagine themselves successful in school, why try? TFA and MTC participants can help their students to imagine themselves as young college graduates. Participants in TFA and MTC may go on teaching or may run for local or state office after their service. They certainly have substance to draw on for making policy recommendations about education in Mississippi once they finish. Given the professional development that occurs in the classroom, prospective employers should be eager to hire alums of TFA and MTC. Consider what effect two years of maturation beyond college yield for those who go through the programs. Participants have demonstrated their interest in service and have refined their abilities as communicators, critical thinkers, and leaders. These programs benefit participants in ways that will last throughout their careers. Even with these virtues, TFA and MTC are not panaceas. They offer a path for talented students to serve their state or country. The programs keep talented people in the state and draw talent from elsewhere. Praise for the programs should not discount the important considerations that Appleman and Guest raise, however: that TFA and MTC are not substitutes for adequately funded schools and competitive teacher salaries. Nevertheless, we have reason to celebrate. A large group of brilliant college graduates are looking to serve the state and the nation. Plus, the calls for support from the governor and lieutenant governor inspire hope that increased support for education and the will to pursue lasting progress are growing. Dr. Eric Thomas Weber is assistant professor of Public Policy Leadership at the University of Mississippi and author of three books, including Morality, Leadership, and Public Policy (2011) and the forthcoming Democracy and Leadership.